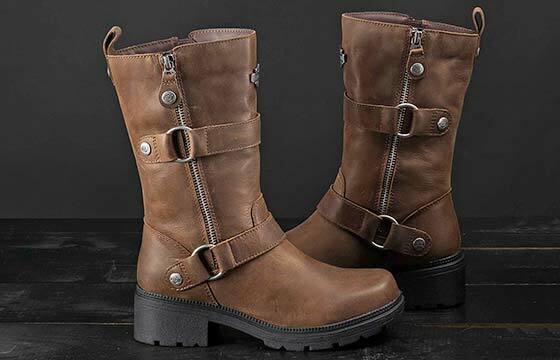 A short women’s boot with just the right amount of attitude. 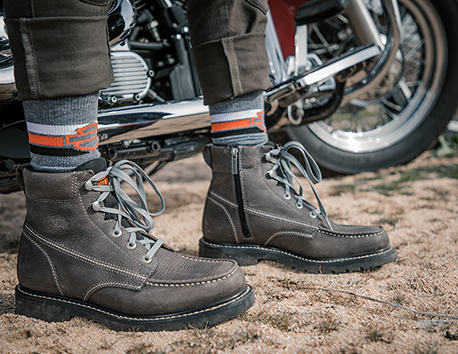 The full grain leather Amherst has a lightweight outsole and heel, with YKK® dual locking inside and outside zippers for fashionable convenience. 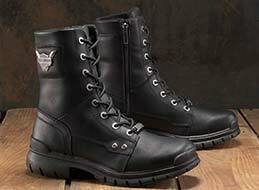 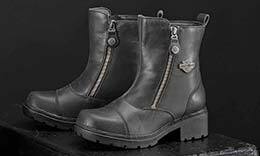 With decorative loop buckling and the iconic Harley-Davidson® bar and shield on the upper shaft, this mid-calf boot has more than enough moto edge. 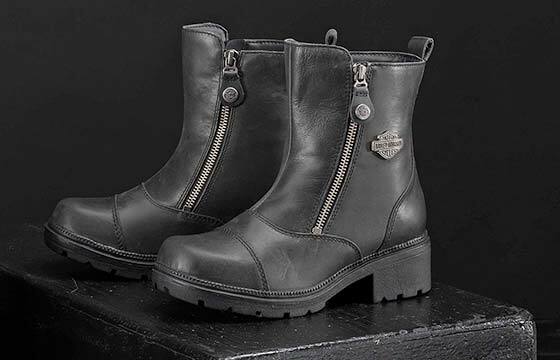 Authentic to the last stud, the women’s leather Kemper is a short boot with extra H-D® edge. 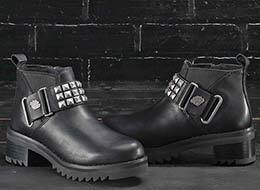 Full grain leather with a pyramid studded ankle strap gives this bootie one hell of a look. 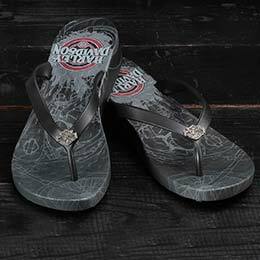 Slip on into these flips for a summer full of attitude. 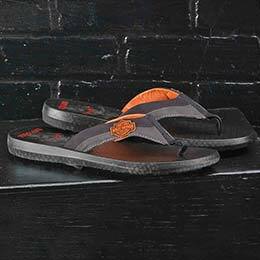 Smooth uppers and a rubber outsole make this sandal a comfortable statement maker. 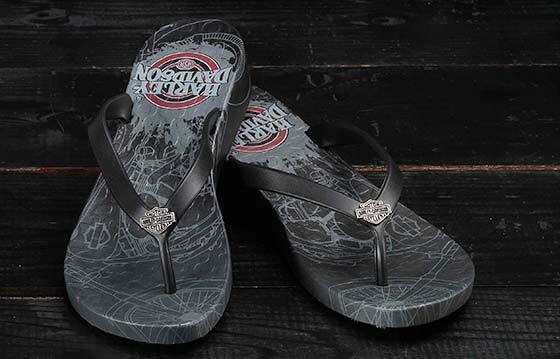 A sandal made for a queen; a queen with ATTITUDE! 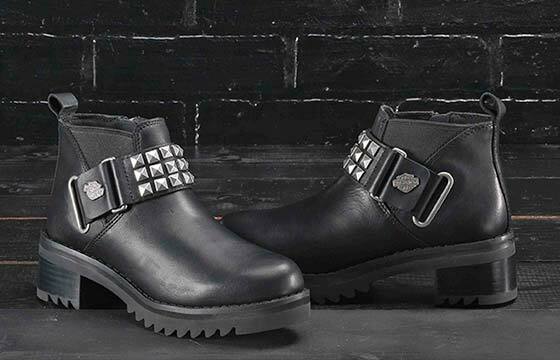 The Ames has silver studs to keep everyone starring. 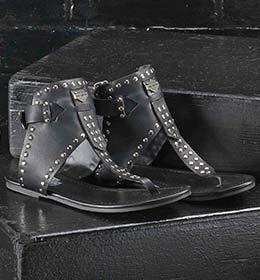 Slip into summer in style this year. 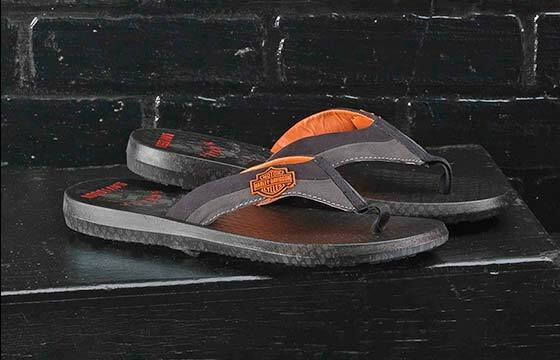 A lightweight men’s flip-flop with unmistakable H-D® color and appeal, the Banks is a must have flip-flop made for the free spirited individual. 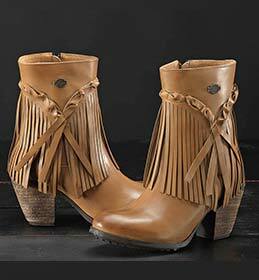 The moto-inspired bootie you have been searching for! 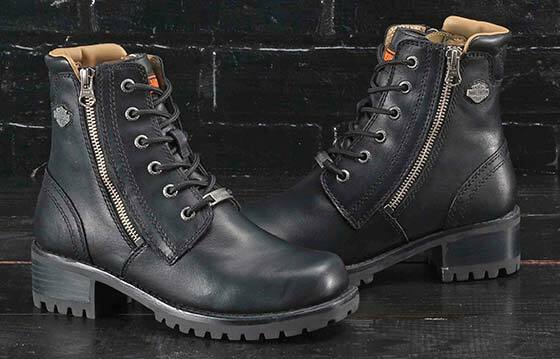 The 5” full grain leather Asher boot is for you. 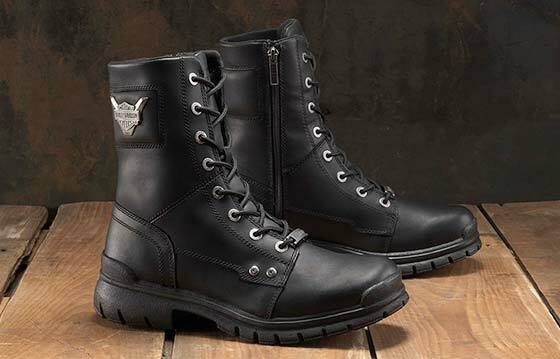 With a lightweight lug outsole and heel, this boot has moto-edge and fashionable comfort. 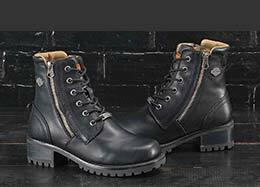 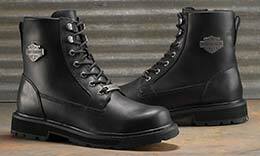 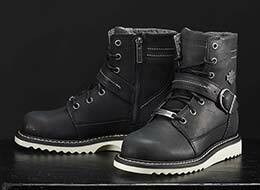 Cartbridge is a lightweight short combat style boot made for all day wear. 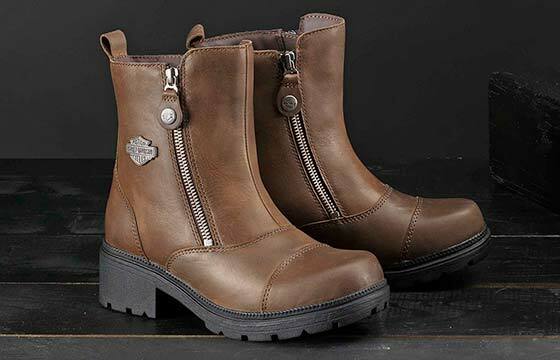 Made with full grain leather, a mesh lining, and a YKK® locking inside zipper for comfort and pull tab on back shaft for convenience, this boot can walk all day and party all night. 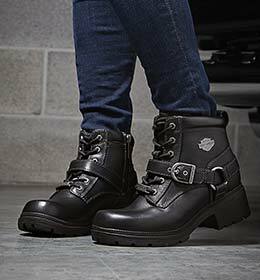 The silhouette of a boot and the sole of a sneaker, the Darton is a women's leather boot featuring full grain leather and a Goodyear® welt construction for trusted durability. 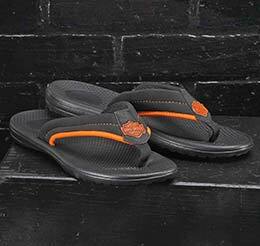 The Larnes sandal packs a punch with a lifted heel and comfortable rubber outsole. 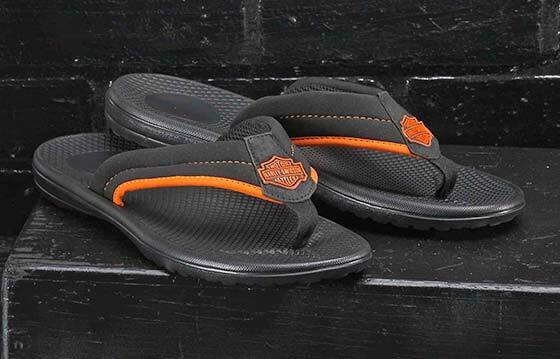 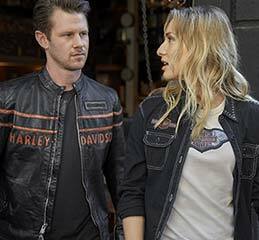 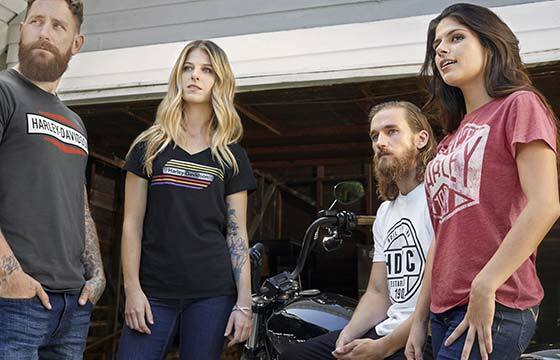 Slip into summer with Harley-Davidson® this year. 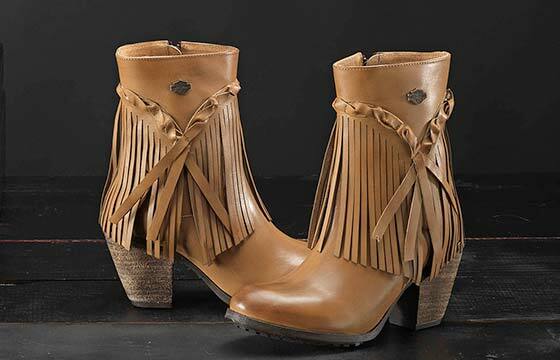 Twisted and fun, the women’s Retta features soft full grain leather and decorative fringe to give you the look you have been craving. 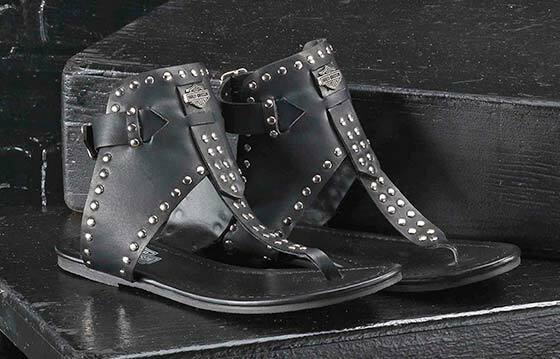 The sturdy 3” heel is made of simulated leather that is uniquely distressed for a look that is raw and rebellious. 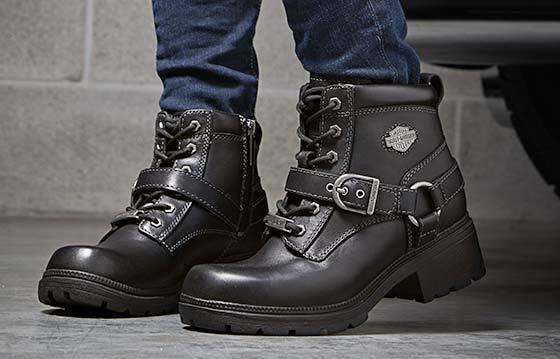 This short lace up women's leather boot features a YKK® locking zipper with a single strap across the top of the foot, and a lightweight outsole and heel for comfortable functional fashion for any journey. 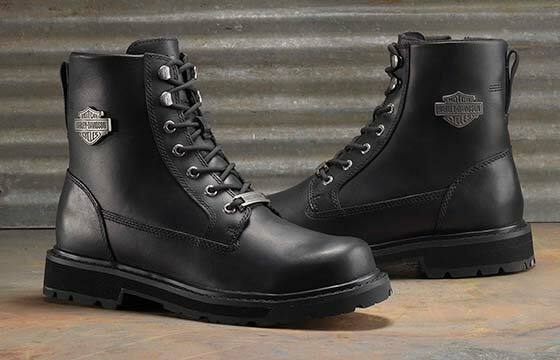 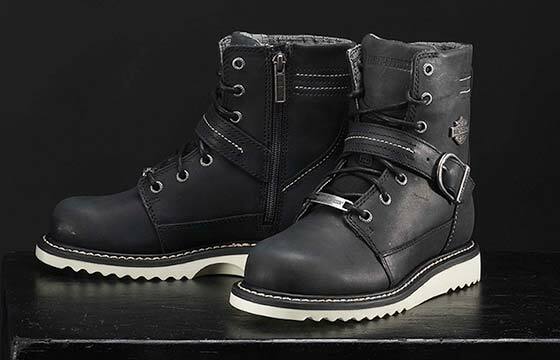 A mid calf men’s boot with a heritage inspired combat silhouette and modern updates. 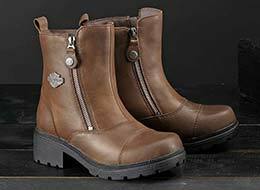 Duntley is a a full grain leather boot with a lightweight outsole and heel. 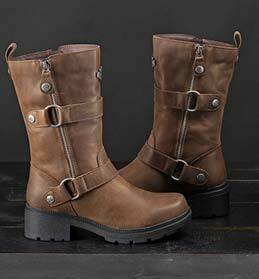 A YKK® locking inside zipper makes this boot comfortable and convenient to put on and take off.